Learn online from subject matter experts on topics relevant to supply chain & logistics and business management & strategy. CITT's hour-long webinars cost only $75, which includes both access to the live webinar as well as the recording & presentation slides. Upcoming live webinars are listed below. Several of CITT's most popular webinars are also available on-demand for everyone in the supply chain logistics sector to watch here for only $75. If you have any questions or need help getting signed up, you can contact Jennifer Traer at jtraer@citt.ca or 416-363-5696 ext. 32. You can also fill in the form at the bottom of this page or click here to sign up for our mailing list to receive notifications about upcoming webinars and other SCL learning opportunities offered by CITT. CCLP designation holders and registered CITT students have FREE access to both live webinars as well as the archive of ALL past CITT webinars. 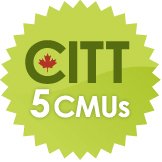 CCLP designation holders & articling participants earn 5 CMUs for your first viewing (live or archived) of each webinar. This webinar examines the merits of each of the eleven terms in Incoterms 2010, including the transfer points for cost (i.e. freight, insurance and customs formalities), and risk. It will also review the appropriate use of Incoterms for various modes of transport, including containerized marine shipments, and the point where cargo insurance should be considered. Learn more. Register. Although Incoterms have become the recognized standard worldwide for international shipments, North American shippers are often confused when it comes to “shipping terms of sale”, particularly “FOB”. This webinar presents an overview of the “shipping terms of sale” that evolved from the U.S. Uniform Commercial Code (UCC), and have been in widespread use in North America since 1952, and reasons why “FOB” has earned the reputation as the most misused shipping term. ​ Learn more. Register.